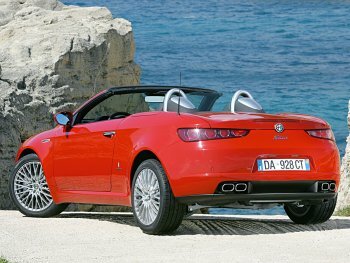 As far as safety is concerned, the Alfa Spider offers the most sophisticated electronic devices to control the vehicle’s dynamic performance (from braking to traction) and push its dynamic limits still further. These devices are not intrusive for the driver but greatly benefit safety. These devices have been developed operationally through simulations and meticulous track testing with the aim of ensuring maximum driving satisfaction. The power-assisted, hydraulic system comprises two cross-over independent circuits, and is particularly effective, guaranteeing prompt, smooth braking combined with minimal stopping distances. The system naturally differs according to the engine version (in terms of weight and power): vehicles equipped with the 2.2 JTS are fitted with 305 mm self-ventilated discs on the front wheels and cast iron floating calliper with piston; the rear brake discs are solid (278 mm diameter) while the calliper is aluminium with a piston. The powerful Alfa Spider 3.2 V6 Q4 is fitted with 330 mm ventilated discs with a four piston monobloc aluminium calliper on the front wheels; a 292 mm disc, also ventilated, with a floating calliper on the rear wheels. This vehicle marks the first application of a monobloc aluminium calliper with radial attachments to the front brakes of an Alfa Romeo: this option increases calliper stiffness without increasing the weight and therefore makes for increased performance, particularly during a sporty drive. In addition to a high-performing brake system, the Alfa Spider also comes with one of the most advanced ABS antilock brake systems on the market today. It features four active sensors and a hydraulic control unit with 12 solenoids. The ABS contains an electronic brakeforce distributor (EBD). This device apportions braking action over all four wheels to prevent locking and ensure full control of the car under all conditions. The system also adapts its operation to wheel grip conditions and brake pad efficiency to reduce pad overheating. The VDC is Alfa Romeo’s version of the ESP (Electronic Stability Program), a system that cuts in under extreme conditions when car stability is at risk and also helps the driver to control the car. As befits a true Alfa, the VDC is a sporting device that allows outstanding roadholding. It allows the driver the full satisfaction of controlling the car as long as conditions are normal but cuts in just before things become critical. The VDC is permanently engaged. The MSR (Motor Schleppmoment Regelung) cuts in when the gear is shifted down abruptly under conditions of low grip. This device restores torque to the engine to prevent the wheel skidding as a result of lock. To achieve this result, the VDC continually monitors tyre grip in both longitudinal and lateral directions. If the car skids, it cuts in to restore directionality and ride stability. It uses sensors to detect rotation of the car body about its vertical axis (yaw speed), car lateral acceleration and the steering wheel angle set by the driver (which indicates the chosen direction). It then goes on to compare these data with parameters generated by a computer and establishes – via a complex mathematical model – whether the car is cornering within its grip limits or if the front or rear is about to skid (understeer or oversteer). To restore the correct trajectory, it then generates a yawing movement in the opposite direction to the movement that gave rise to the instability by braking the appropriate wheel (interior or exterior) individually and reducing engine power (via the throttle). This is the key attribute of the device designed by Alfa Romeo engineers. It acts in a modulated fashion on the brakes to ensure the action is as smooth as possible (and the drive is not therefore disturbed). The engine power reduction is contained to ensure outstanding performance and great driving satisfaction at all times. • a gyroscopic sensor installed on the passenger compartment floor to record car yaw and lateral acceleration. The ASR (Anti Slip Regulation) system, an integral part of the VDC, optimises traction at any speed with the aid of the brakes and engine control. The device computes degree of slip on the basis of wheel rpm calculated by the ABS sensors and activates two different control systems to restore grip: when an excessive power demand causes both drive wheels to slip (e.g. in the case of aquaplaning or when accelerating over an unsurfaced, snowy or icy road), it reduces engine torque by reducing the throttle opening angle and thus air flow; If only one wheel slips (e.g. the inside wheel following acceleration or dynamic load changes), this is automatically braked without the driver touching the brake pedal. The resulting effect is similar to that of a self-locking differential. 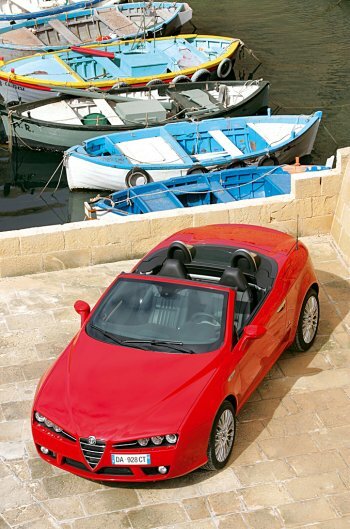 This allows the Alfa Spider to get out of trouble easily on road surfaces with low grip. The ASR is activated automatically whenever the engine is started but must be turned off by means of a cut-out switch on the central console. The ASR needs be turned off only when snow chains are used because the wheel must be able to slip by tiny amounts to pile up the snow so that force can be transmitted to the ground and the ASR tends to prevent this occurring. The equipment array on the Alfa Spider is completed by the HBA system, the hydraulic electronic hydraulic braking assistant which automatically increases the pressure in the braking circuit during emergency braking. And by the Hill-holder system, which maintains the braking pressure for a few moments after the driver removes his foot from the pedal, to simplify hill starts and prevent the car from slipping backwards. Passive safety also benefits from state-of-the-art technology. And goes on to include a new chassis designed to absorb impact with maximum efficacy. Occupants are also protected by the body and doors, without forgetting the Isofix attachments for carrying the tiniest occupants with maximum safety. The car also offers innovative restraint systems (pretensioner on the buckle and a degressive load limiter on the seat-belt) and airbags: front with two-stage activation, sidebags and new devices to safeguard the knees. These kneebags prevent contact with the dashboard surface and help achieve the highest safety levels (depending on markets and outfits, the passenger kneebag may be optional). In detail, the two front airbags have two-stage activation: for the driver (with capacity of 60 litres) and passenger (120 litres). Their operation is controlled by an electronic control unit on the tunnel that evaluates impact severity by means of sensors that are calibrated by conducting crash tests in the laboratory. The system comes with a diagnostic circuit for checking components electronically. The components are tested by a processor that monitors their operation continuously. The airbags will not be activated by low speed accidents (for example, a slight shunt or a bump while parking) or by stresses that are not due to impact (e.g. driving fast over a pothole). The front passenger airbag may be deactivated manually (depending on the market) so that a baby can be carried in a seat with its back to the direction of motion (the pretensioner remains active). The Alfa Spider is fitted with two sidebags to protect the pelvis and chest of occupants when the car is struck from the side. They are located inside the front seat squabs. This solution ensures the best possible protection for passengers regardless of their stature, sitting position or seat setting. For geometrical reasons, it is also possible to use a 12 litre airbag: this volume is lower than an airbag housed in the door would require to offer the same protection. If an accident occurs, the sensors controlling activation of these airbags receive a side acceleration signal which is sent to the electronic control unit that is also responsible for operating the front airbags and seat-belt pretensioners. All systems are managed in an integral manner in accordance with a strategy of total, progressive occupant safety.